An online conversion tool between U.S. cooking measures. The tool will convert between gallon, litre, quart, pint, cup, gill, shot (jig), fluid ounce, tablespoon, teaspoon, fluid dram, millilitre, and drop (minim). By starting off with a measure, it will calculate what the measure is in the other units. 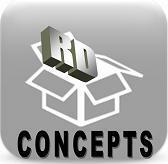 RD Concepts utilizes the honor system for our online software products. We suggest a one time fee of $.99 to utilize this product, but we appreciate however much you feel comfortable with. You can make a payment via PayPal.